Is the Ice on Pluto Slippery Enough for You to Fall On? It’s been a good day for Pluto and its fans: Already, we’ve learned that we were underestimating its size (sorry, little friend!) and that those ice caps atop the almost-planet are made of methane and nitrogen ice. But what would stepping out on that ice be like? Perhaps not quite how we’re used to. In response to learning about the ice on Pluto, commenter M3000P asked us a question: Would that ice be slippery? Setting aside the question of how we would get someone to step onto the surface in the first place, though, the problem of figuring out an answer is not just the ice itself: it’s what the ice is made of. On Earth, the ice we encounter outside is almost certainly simply frozen water. But that isn’t always the case when we venture a little further outwards into the solar system. On Mars, for instance, the polar icecaps are not just polar icecaps, they are actually dry icecaps. Meanwhile, a little further towards the equator, the ice on Mars seems to contain some kind of natural anti-freeze agent that makes it melt and flow more easily than we expect even in the frigid cold. Skiing or snowboarding on Mars could be attempted on either the CO2 part of the ice cap, or the water ice part. Evidence suggests the water ice part of the cap is very ancient, and is therefore probably very dense; ice skating would be a better fit. On the fresh seasonal CO2 cap, with up to 20% made of fluffy snow, skiing might be possible. At about 1/3 the surface gravity of Earth, it would take longer to achieve a given speed on a slope, although air resistance would be negligible. “Getting air” would be much easier in the reduced gravity, so I would recommend installing a half-pipe for some insane aerials. A significant unknown is how skis or boards would perform on dry ice. Unlike on terrestrial snow, which is slippery because it typically has a thin melt layer surrounding the grains, carbon dioxide is truly “dry ice.” When heated (by friction, for instance), it will sublimate straight to the gas phase. If the friction beneath a ski is too great, this could generate a layer of air, causing a total loss of control. Finally, because the CO2 snowfall occurs almost exclusively in the polar night, you had better bring your night-vision goggles. 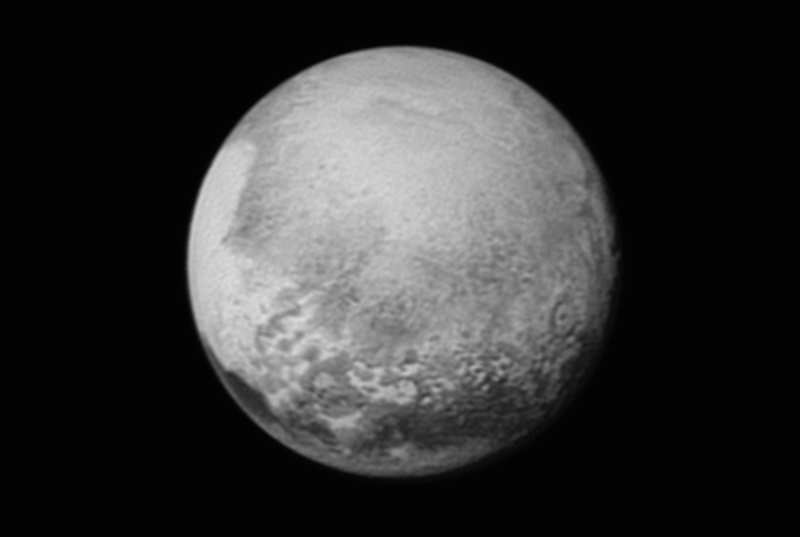 So, knowing all this, what might we expect from a Plutonian-ice of methane and nitrogen? Would it be enough like our own that we might slip on it? The answer is, simply, that we don’t know yet. We do, however, rather enjoy this theoretical answer below from commenter iCowboy on what our own more earth-based research suggests about whether that ice might be slippery. To get a real answer, though, we’re just going to have to wait until we get a whole lot closer. Fortunately, that’s the plan. Actually not a stupid question because we still really aren’t sure why water ice is slippery. The old theory was that the pressure of your foot or a skate caused part of the ice to melt providing a lubricating surface, as the skate moved away the water refroze. But the maths doesn’t work out for that theory. You can ski on dry ice which is frozen carbon dioxide, apparently it isn’t as slippery as water ice, but it does mean we could hold the Winter Olympics on the South Pole of Mars. AFAIK no one has ever tried this with other frozen gases - though please video it if you insist on trying with hydrogen. There have been experiments which show that atoms on solid surfaces vibrate with more force than those in the interior causes some weird effects. Even in perfect crystals, atoms at the surface can be completely disordered creating an atom or molecule-thick film that has a very low friction and behaves like a liquid. These films seem to exist in water, they’ve also been discovered in lead well below its melting point, and curiously enough - on diamond, which under the right circumstances is even more slippery than ice! Which is a long way of saying ‘buggered if I know’, but I fully support a mission to go find out.